Like many of you (I’m guessing, since you’re here), I spend a significant portion of my waking hours online. I spend so much time on the Internet that I sometimes mistake the virtual world for the world-world. Looking through the lens of social media and frequently visited websites and blogs, it’s easy to get a distorted view of pop culture. If I never left my house (or looked away from my computer screen), I would believe that Breaking Bad is the nation’s most popular TV show, Drive the most successful movie, and whatever Pitchfork and Stereogum are covering this week the biggest band. But I do leave my house occasionally, and I know that what seems like common knowledge on the web is in fact a curated version of reality that, at times, gives off an impression of how things are that is flat-out wrong. The fact is that a lot of cultural institutions that have been dismissed as passé, if not on the verge of extinction—network television, daily newspapers, summer blockbusters, compact discs—are in fact still drawing a plurality (if not a majority) of available eyeballs and eardrums. Meanwhile, if you’re the sort of person who gets riled up about how “everybody” can’t stop talking about Bon Iver or Portlandia or some other indie sensation, you know you can turn your computer off and probably never have to hear that chatter again, right? The beauty of living online is that you can invent whatever vision of the world (or yourself) you prefer, and remove the surrounding context to make it seem like the only, true vision. Even if you know deep down that it’s not—and I think we all know it deep down—the mirage is so seductive and seemingly tangible that any doubts inevitably get brushed aside. But those doubts come rushing back as I listen to my local, highly rated modern-rock radio station. I turned it on about 10 minutes ago, right in the middle of Alien Ant Farm’s hit 2001 cover of Michael Jackson’s “Smooth Criminal.” After that it was Fatboy Slim’s “The Rockafeller Skank” from 1998—a.k.a. that “funk soul brother” song you’ll now have in your head for the rest of the day—and now it’s “Tighten Up” by the Black Keys, from 2010’s Brothers. Based on my previous experiences tuning in to this station, I expect this pattern will hold for however long I decide (or bear) to listen: a playlist that consists mainly of rock (or rock-like) radio hits from the ’90s and early ’00s, rounded out by a select serving of well-played songs from contemporary bands. At least I’m familiar with (and like) the Black Keys; I wouldn’t know many of the newer bands lodged on Billboard’s top rock songs chart—Cage The Elephant, AWOLNATION, Five Finger Death Punch, Young The Giant—if they walked up to me in an Ed Hardy shirt and white baseball cap and handed me a lukewarm can of Coors. In contrast, two of the most hyped rock records of 2011, Girls’ Father, Son, Holy Ghost and Wild Flag’s self-titled debut, debuted on the same week’s chart at No. 35 and 51 respectively—fine showings that nevertheless pale in comparison with the amount of glowing reviews they received on the web. This isn’t merely a difference between “critics’ bands” and “popular bands.” Depending on which circles you frequent online, you might be surprised that Staind and Bush still even exist, much less have enough commercial relevance to have new material in heavy rotation on the radio. For other people, Girls and Wild Flag might as well be made-up “indie-rock sounding” band names from Hipster Runoff—if they actually knew what Hipster Runoff was. These days, you can be a rock fan and follow a genre of music that seems totally removed from what another rock fan might like. Which isn’t really true—or as true, anyway—if you’re a fan of, say, hip-hop, where stars like Kanye West and Drake dominate the charts and the media coverage. A few months ago I used the term “silent-majority rock” to describe bands that garner lots of radio airplay and little or no press attention. I was referring specifically to one of the year’s biggest and most surprising success stories, Foster The People, whose debut album Torches has sold more than 320,000 copies on the strength of the inescapable single, “Pumped Up Kicks.” Like “Kicks,” which sounds like an amalgam of Peter Bjorn And John’s 2006 smash “Young Folks” and recent hits by MGMT and Phoenix, Torches is fluffy, likable indie pop that’s custom-made for radio stations looking for something fun and light to slot between Smashing Pumpkins and Offspring oldies. Foster The People doesn’t have much heft or substance, but you have to be a pretty big grouch to out-and-out hate its music; it’s no wonder that another song from Torches, the similarly earworm-y “Helena Beat,” is currently moving up the Billboard rock chart. 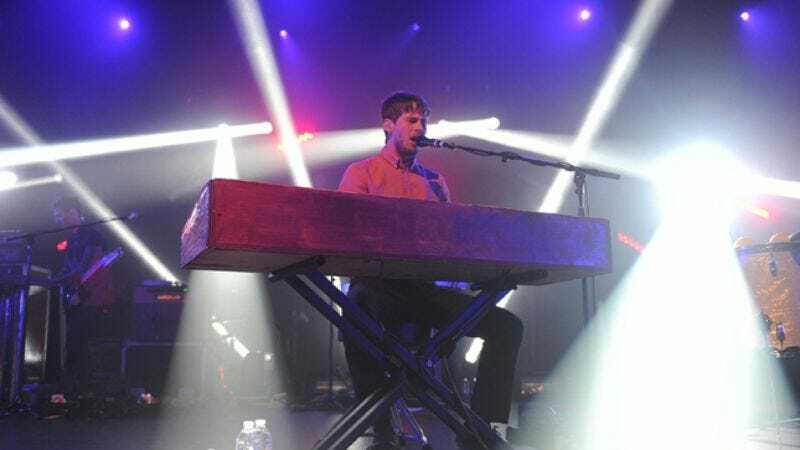 Foster The People’s success recalls the trajectory taken in 2010 by the well-coiffed pseudo-bluegrass act Mumford & Sons, whose blockbuster debut, Sigh No More, stands at 1.8 million sold and counting. Those are Katy Perry and Lady Gaga numbers and—considering no rock albums ranked among last year’s top 10 best-selling records—an incredible haul for a bunch of guitar-slinging Brits in the modern era. Like Mumford, Foster The People isn’t tracked by prominent music sites posting the band’s latest MP3s or video from its late-night talk-show appearances. As far as much of the music press is concerned, Foster The People and Mumford & Sons aren’t even worth acknowledging, in spite of their popularity and “indie-ish” sound. Not that it matters to Foster The People, who have something much more valuable than buzz: the support of a label, Startime International, that’s an imprint of Columbia Records, which has aggressively pushed Torches since its release in May. At the independent record store in my neighborhood, there’s a Foster The People CD display right next to the cash register, just like chewing gum or tabloid magazines at the supermarket. Surely there are people who have heard “Pumped Up Kicks” 37 times on the radio this week who are going to end up making Torches an impulse buy. The lesson here is that terrestrial radio and major labels still have some power in the modern music landscape—much more power than it appears if you’re focused solely on online media. So much chatter on the Internet revolves around dismantling old-media machinery and replacing it with a less centralized system. We appear to be on our way to doing that. But the old music-industry beast still has a pulse, and it’s not crawling off to die quite yet. In fact, it is whistling a catchy tune that’s likely playing on a radio station near you this very moment, whether you happen to be listening or not.